If you're an iPad-wielding poet, Dante Varnado Moore's Poet's Pad might help spark your creativity. Poet's Pad is designed to let poets write, arrange, and store all of their creative writings and poetry concepts, while offering a few tools to help provide inspiration. Poet's Pad features a dictionary, thesaurus, and a rhyming dictionary with 70,000 words—each of them searchable, which should help get you off to a good start. Its word processor organizes your writing into stanzas, making it easier to organize and rearrange your poems, and sticky pads are provided next to the writing area so you can quickly jot down ideas and inspirations as they come. A helpful feature in Poet's Pad is the Emotion Based Idea Generator, which randomly generates words and phrases according to a mood category you select, such as 'Love', 'Hate', 'Hope', 'Fear', etc. The words and phrases that are generated can be posted to sticky notes for later use. Poet's Pad also includes a digital audio recorder which could come in handy for poets who prefer spoken word or slam poetry to the written word. Once you're satisfied with your work, or wish to continue on another computer, you can export your poems in both written and audio form via e-mail. 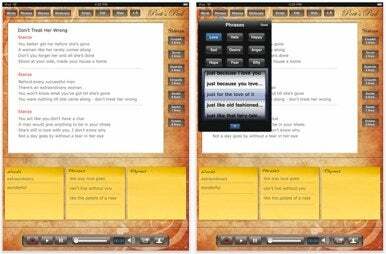 Poet's Pad, which runs on iOS 3.2 or later, is being offered at an introductory price of $7, after which it will be priced at $10.